Stay at the Saugerties Lighthouse « Hudson River Historic Boat Restoration and Sailing Society Inc.
and Ginger Gellman Bliss of Rutland, Vermont. Congratulations to them and thank you to all who supported this fundraiser. go directly to their website and mention our name. If you missed the raffle and would like to make a donation to help us put the wind in our sails we’d be so happy! The B&B is open Thursday thru Sunday nights year round and accessible by walking a gentle quarter mile trail when the tide is low, or by your own small boat. There are two bedrooms on the second floor. with east or west views of the River & double beds. Guests share a first floor bathroom. A hearty breakfast is included with your stay & you are welcome to carry food out to the Lighthouse & make use of the kitchen and grill for other meals, or choose to dine in town. 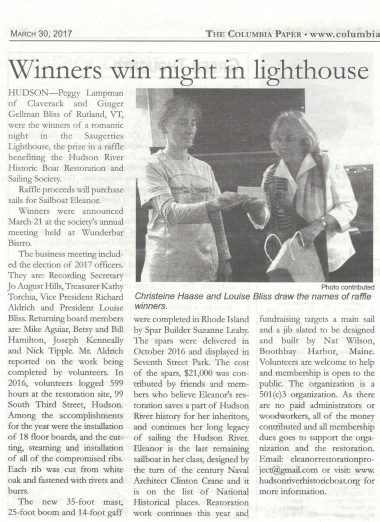 Like the Eleanor, the Lighthouse is on the National Registry of Historic Places. In 1834 the U.S. Congress appropriated $5,000 for a lighthouse at the mouth of the Esopus Creek. It was required to guide ships away from nearby shallows and into the Esopus Creek when Saugerties was a major port with daily commercial and passenger transportation. 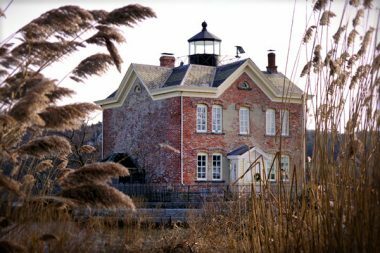 Read more about its history and specifications and watch the video documentary A Light on the Hudson on the Lighthouse website. The Lighthouse begins taking reservations for April through December in early January, and for January through March in early June. 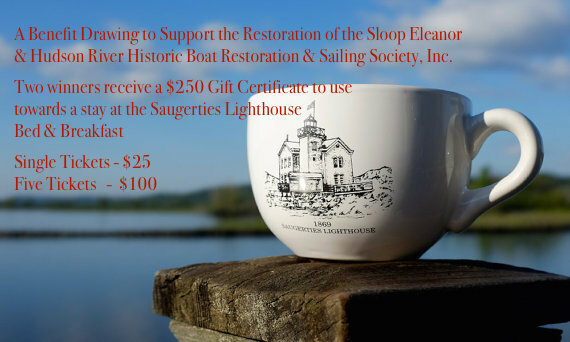 Priority is s given to Gift Certificate holders and members of the Saugerties Lighthouse Conservancy. Loyal guests have the option of booking ahead for the next year. There is a two-room or two-night minimum on Friday and Saturday. We encourage you to refer to the website so that you are familiar with the policies and facilities at the Lighthouse and to sign up for the Room Vacancies Email List.